Tiny desks are arranged on the carpeted floor. The curved walls are festooned with fairytale characters. A whiteboard stands at one end. This yurt has been converted into something new for semi-nomadic Kyrgyz who spend the warmer months on the Aktash jailoo, or highland pasture: a school. During the school’s first weeks in operation, some children had trouble socializing, according to Jenishgul Sharsheeva, 45, the teacher. 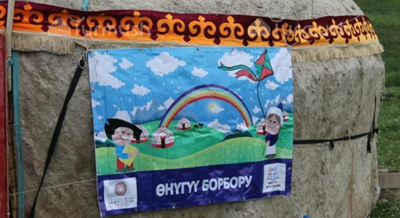 “When they stay at the jailoo, where the nearest family can be more than a kilometer away, children hardly make any friends,” Sharsheeva explained, adding that even with her 18 years’ experience in teaching preschool in a village below the mountains, working with jailoo children was a challenge. The Soviet collectivization drive during the 1920’s and 30’s forced most Kyrgyz to abandon their traditional nomadic lifestyle. Yet, today some families still lead semi-nomadic lives, travelling into the mountains with their cows, horses and sheep to graze during the summer months. Few stay in the jailoo year-round; the semi-nomadic herder families mostly hail from remote villages, where their children receive only a rudimentary education. And few have the opportunity to attend preschool. 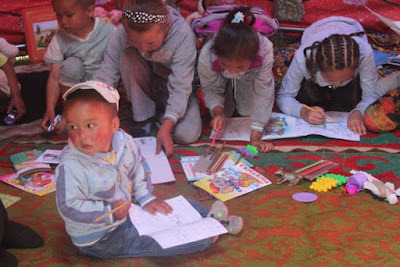 AKF has opened 20 jailoo preschools around Kyrgyzstan since 2006. Their idea is now being replicated by a local foundation run by former interim president Roza Otunbayeva. That initiative oversaw the opening of 100 jailoo preschools in 2016, including Ananaika. Up in the jailoo, at Ananaika, the children are learning to differentiate a triangle from a circle by constructing the shapes with pinecones on the grass. “These children are so thirsty for education, for knowledge,” Sharsheeva, the teacher, said. “Teaching a kid who is seeing a book for the first time in his life is a different experience for me, but I love it and I hope that next year we can take more children. 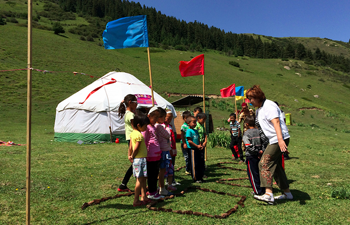 Since then, many more yurt preschools have been established with the assistance of the Roza Otunbayeva Initiative and the Aga Khan Foundation.